Are you Gas Safe registered? Would you like the opportunity to meet with the register for a constructive debate on the heating industry? Installers First- a community of professional accredited heating installers- is hosting an Audience with Gas Safe, as an opportunity for gas engineers to meet with Gas Safe, discuss current industry activity, opportunities and challenges and help shape the future of the industry. “When Installers First launched in May 2017, we asked installers to tell us what they stood for and what they wanted the Installers First community to facilitate. I refer back to those ‘asks’ regularly to make sure we are delivering what installers want. “A level playing field. Unity, together. Staying up to date. Gas Safety. To be heard. Inspections and Change in the industry were all asks written at that launch event. 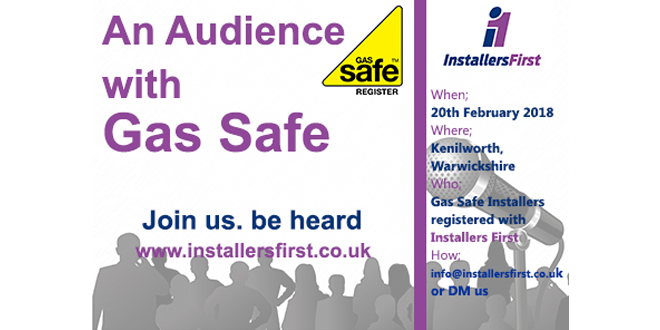 This ‘Audience with Gas Safe’ event provides the platform for all those asks. “The heating industry belongs to the professional accredited engineers within it. However, as with all industries and businesses there are many other component parts to it, which are crucial to its success. Installers First want to bring together those component parts to ensure that the industry, moving forward, is as effective as possible. The event is open to installers registered with Installers First. If you are not yet registered; Visit www.installersfirst.co.uk today. Places are limited, so if you are interested please make yourselves known via the options below. If you have a question for Gas Safe that will help provoke a constructive debate, please include your suggestion with your booking notification.